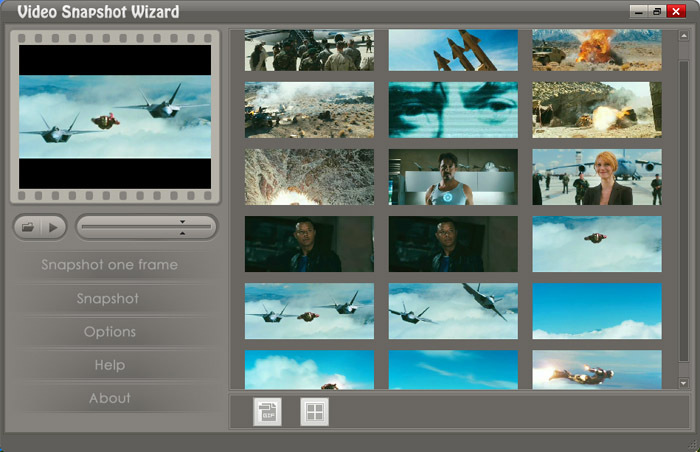 Video Snapshot Wizard is an easy-to-use utility that allows to capture a still from a movie. The software provides support for the most popular video format such as AVI, FLV, ASF, MOV, RM, RMV, MPG, MPEG etc. Except that frame grab ability like others video-frame-capture software, Video Snapshot Wizard can also edit frame image, output as bmp, jpg, gif graphics, and can even rebuild the frames to create animated GIF image or movie thumbnails. an easy-to-use utility that allows to capture a still from a movie. ...... frames to create animated GIF image or movie thumbnails. *Capture frames from movie files. Support the most popular video formats. *Display frames using thumbnails view mode. *Output frames as a custom-defined animated GIF image. *Edit your favorite pictures and make your thumbnails. Captures your favorite movie scenes or screen to single picture files. Qweas is providing links to Video Snapshot Wizard 1.2 as a courtesy, and makes no representations regarding Video Snapshot Wizard or any other applications or any information related thereto. Any questions, complaints or claims regarding this application Video Snapshot Wizard 1.2 must be directed to the appropriate software vendor. You may click the publisher link of Video Snapshot Wizard on the top of this page to get more details about the vendor.